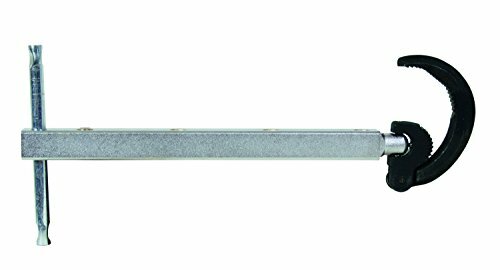 General Tools 140XL Basin Wrench (sometimes called a sink or faucet wrench) provides access to faucet nuts that are sandwiched between the sink basin and wall. The wrench's ratcheting head pivots up to 90 degrees to allow contact with the nut in even the tightest situations. The spring-loaded jaw mechanism provides one-handed ratcheting for effortless installation and removal. This item is equipped with a sliding t-handle to increase leverage and avoid contact with the wall or pipes. Extendable handle adjusts from 11 inches to 16 inches. GENERAL TOOLS - THE PRECISE TOOL FOR DOING THE JOB EXACTLY RIGHT. Offering over 1,000 tools, we’re proud to provide tradesmen, craftsmen and DIYers around the world with a broad range of affordable, specific-purpose mechanical hand tools and precision measuring and inspection tools. WORK SMARTER, MEASURE BETTER & BE MORE PRODUCTIVE WITH GENERAL TOOLS.